Recently (may be in Nov 06) after booking movie tickets at Urvashi, I had been to MTR for breakfast. There were two gentlemen sitting opposite to me. From their discussion I made out that they are involved in hoarding business. They were discussing about placement about hoardings in ring road. 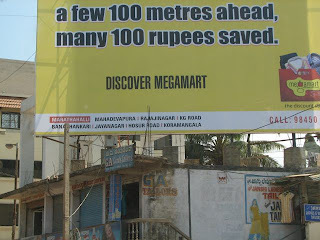 The discussion made me conscious about advertising hoardings in Bangalore. The boring 30+ km travel to my workplace has given opportunity to have a glance various hoardings. There are many stuffs in these hoardings from career opportunities to apartments. According to me some important features of a hoarding. -Attention getter: This is really important for a hoarding. Some catchy stuff should be there in a hoarding. 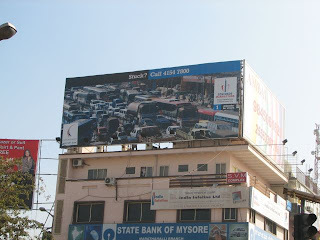 -Placement: Usually hoardings are placed where traffic congestion is common. (Marthalli Bridge, Airport Road, Ring Road near Sarjapur Signal). Everyone is frustrated with Bangalore Traffic. Concorde Manhattans, a construction company have the solution for it. They are marketing it by a nice hoarding placed at Marthalli Junction and near Sarjapur Signal. 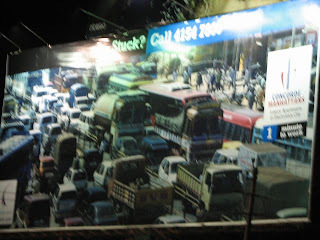 The attention getter to this hoarding is picture of a Traffic Jam. 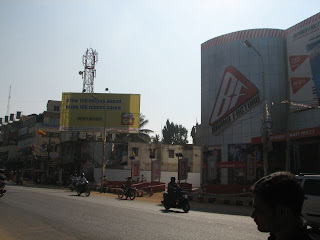 There was one hoarding of Applied Materials with punch line ‘flex your brain’, placed right after Marthalli Bridge towards Kundanalli gate. It was there till Nov 30 2006 (couldn’t take its snap). I am sure all users of Marthalli Bridge would have read this hoarding and majority of them would have posted resume to HR email contact mentioned on it. To conclude I have posted my findings about hoardings so far. I will updating this post with new findings, photographs etc. There was a Hoarding in Mumbai for Ginger Hotels which advertised for its lower prices. The most interesting part of the hoarding was divided into 4 parts, with connections between the lower and upper stairs with a stair case, and a person used to stay in that hoarding from Morning till night !!! I think this is an out of box concept in advertising !! I too have a good one to share, a hoarding advertising a tailor...it read..
"God makes man, tailor makes gentleman"
Ya that is true. Hoarding Business making most of traffic jams!!! thanks to all for comments. @vinay thanks for pic of Ginger Hotel hoarding. @viditha thanks for ur sharing. Sir, By reading various comments, I have come to know that sofar Hoarding Advertising is mainly of Still Photo of Advertisement Presentation. Now you can show the same in the form of Video Communication. If interested you can contact me at 9820949052 suri. You can directly advertise on hoardings in Mumbai through Hoarding India. We are in the process of adding many partners who can help SMEs like yourself get the outdoor media youre seeing for. You can come in contact with us and well serve you with the media youre interested in.